Kenya is iconic wildlife territory, place of the annual wildebeest migration and the mighty Great Rift Valley. Millions of migratory flamingoes find sanctuary in the Rift Valley lakes. Keri Harvey visited Lake Nakuru to experience this phenomenon first-hand. Flamingoes as far as the eye can see feed in the alkaline waters of Lake Nakuru. The birds migrate from lake to lake within the Rift Valley system. The road from Nairobi to Nakuru is easy driving, through small towns and villages and often hugging the edge of the Great Rift Valley. Down below on the valley floor, farmers in small settlements plant, grow and harvest their crops and co-exist peacefully. The Great Rift Valley is actually over 6 000km long and runs from Mozambique to the Dead Sea in Jordan – believed to be the lowest point on earth at 400m below sea level. Along the valley edges, the scenery is dramatic and beautiful with unusual geography that has resulted in the formation of a string of soda lakes. Created by water seeping through volcanic rocks for millions of years, these alkaline lakes support a teeming bird population. It’s the end of the rainy season in Kenya, and dark clouds overhead threaten rain. Within minutes huge drops splatter in the dusty roadside and pedestrians pull out colourful umbrellas. The rain is soon over and the skies clear for our visit to Lake Nakuru. The town of Nakuru is on the edge of the national park. Ahead of us, as we descend into the park, is a magnificent fever tree forest. Our guide, Johnson Kikuyu, says this is one of the best places in Kenya to see leopard. But today we have come to see flamingoes. And through the fever trees, we spot the shimmering pink of thousands and thousands of flamingoes on Lake Nakuru. Estimates put the figure at somewhere between 1 million and 2 million flamingoes on Lake Nakuru alone, but the birds are so tightly packed it’s difficult to count them. Disturbances cause them to move and jostle for position, in a type of feathery Mexican wave. The sound of birds gets louder, providing an unexpected ruckus in the bush. Stepping out of the vehicle we move closer to the vast expanse of flamingoes, and see there are greater and lesser flamingoes, as well as pelicans, herons, cormorants and other assorted long-legged water birds. The flamingoes seem oblivious to our presence, until we overstep the invisible line of their comfort zone and with a flurry of feathers and a rush of noise they move away. We are speechless at the sight before us, and so too are the German tourists joining us to gaze in awe at this unique spectacle. Lake Nakuru National Park was the first national park in Africa proclaimed to protect bird life. The 190km² park established about 50 years ago is also home to more than 50 species of mammals, including rhino, endangered Rothchild’s giraffe, black and white colobus monkeys, Grant’s and Thomson’s gazelles, zebra and buffalo. Nakuru also boasts the biggest Euphorbia forest in Africa. 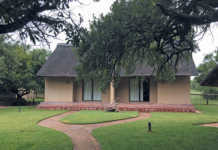 There are over 400 bird species which attract birders and nature lovers. Nakuru is a larder for birds with 7t of fish a day taken from the lake and 185t of spirulina (a blue-green freshwater algae) a day eaten by the flamingoes. 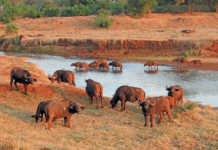 Visitors on a game drive may see rhino and buffalo and view the flamingoes from a mountain top site. 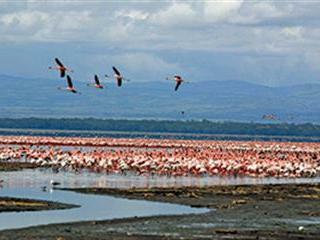 Virtually the entire circumference of Lake Nakuru is pink with flamingoes. It’s breathtaking, even if you’re not an avid birder. Nakuru National Park is two hours north-west of Nairobi along one of Kenya’s most scenic routes. 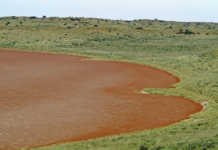 En route back to Nairobi, we pass Lake Elementaia – smallest of the soda lakes – also teeming with flamingoes. The freshwater Lake Naivasha, at 1 910m above sea level, is a favourite weekend getaway spot and is open for fishing and sailing. Naivasha is also home to 400 bird species. On our journey we pass Masai men dressed in red blankets walking along the roadside. Johnson, our guide, tells us they’re homeward bound after a day of tending their herds, but there is no Masai village in sight and I think we may be back in Nairobi long before these herders get home. Lake Borgorio, one of the most scenic of the Kenyan Rift Valley lakes, has a dramatic background escarpment and its shores are dotted with active geysers and hot springs. Thousands of flamingoes visit the lake. Lake Baringo is one of two freshwater lakes in the Kenyan Rift Valley. Its waters are often brown because of soil erosion in the catchment area. One of Kenya’s birding hotspots, over 470 species have been recorded here. Visas: not needed by SA passport holders. Health: yellow fever and malaria precautions necessary.